The Stade Louis II is an exotic stadium located in Fontvieille, Monaco, serving as the home venue for both AS Monaco and the Monaco national football team. The 18,523 capacity ground hosted the annual UEFA Super Cup match for over a decade between 1998-2012 and is also used for Track and Field Athletic events such as the World Athletics Final. Stade Louis II is the long-standing home of both AS Monaco and the Monaco national football team after replacing the original 1939 version of Stade Louis in 1985. Named after Louis II, Prince of Monaco (1870-1949), the stadium is built on reclaimed land and it boasts another unique distinction in being able to seat almost two thirds of the country’s 36,371 population which is quite remarkable. Football fans from around Europe may well know the iconic venue as the host of the annual UEFA Super Cup match between 1998-2012 where the winners of the Champions League faced the winners of the UEFA/Europa league with Monaco provided a glamorous backdrop to this elite footballing event. 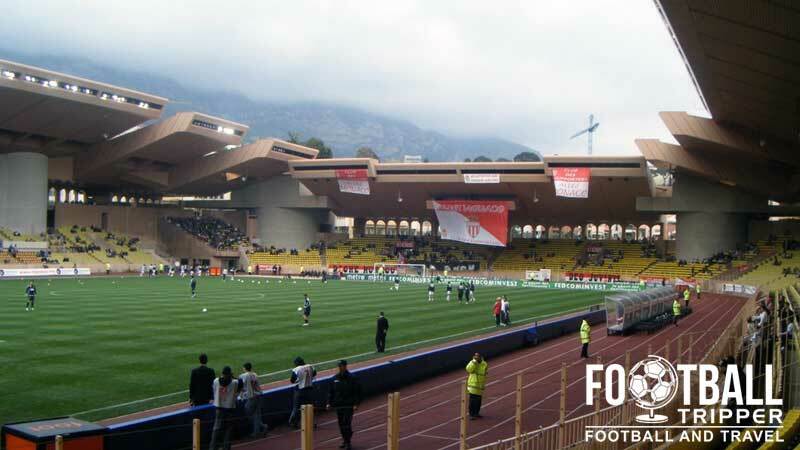 With a lot of the facilities such as the car park built directly under the pitch, the quality of Stade Louis’ playing surface has often attracted criticism from managers’ although to what extent this is too blame remains to be seen. As a country which is lacking in land mass, it is no surprise to know that the stadium is used as a multipurpose sporting venue with the perimeter of the pitch being occupied by an athletics track. Gaston-Médecin indoor Sports hall located beneath the stands is capable of hosting Basketball, volleyball plus other sports and a full size Olympic swimming pool facilities known as Prince-Héréditaire Albert. Overall despite lacking in size, AS Monaco’s home is one of the most iconic stadiums in the world with distinct architecture such as the 9 arches outside, and the Mediterranean backdrop which provides glorious sunshine and deep blue skylines. 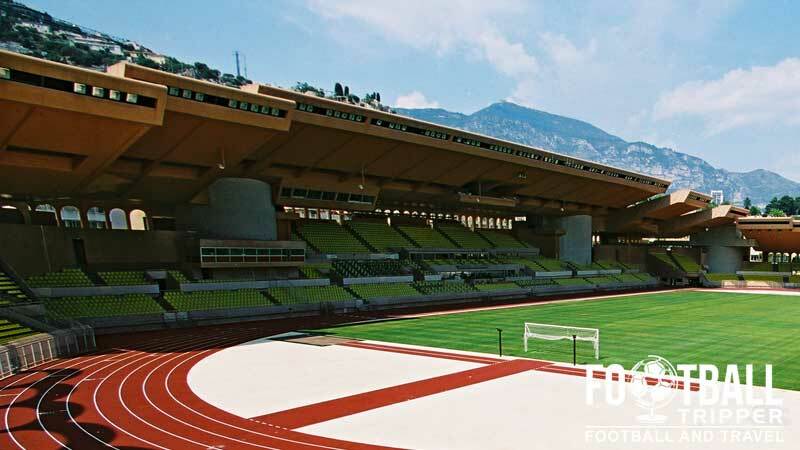 Stade Louis II is comprised of four stands: Nord, Est, Ouest and Sud. Away fans who make the trip to Monaco are housed within the southernmost corner between the Populaires goal-end and the premiers tribune. This translates as sections G-H according to our seating plan, however things are slightly complicated as it isn’t north facing. The map below outlines some of the most football friendly places to drink in Monaco, however expect to be charged a few euros more per pint due to the high cost of living in the local area. There aren’t too many restaurants surrounding Stade Louis but you can always purchase the usual fast food options within the Stadium. If you exit the Monaco borders and head West around along the seafront you will find a number of cafes and restaurants such as Docks Café and Restaurant A’trego within 5 minutes, or you could just wait until you head back to your hotel or the city centre where numerous and expensive options await. Although there doesn’t appear to be a permanent AS Monaco club shop, there are a series of mobile kiosks which open on matchdays as per the picture below. There is also a largish shop located 1.5 km away from the stadium on route to Port Hercule (16 rue Grimaldi) as well as Monaco’s Boutique Officielle . The exterior of AS Monaco’s club shop outside the famous pillar of the Stade Louis. 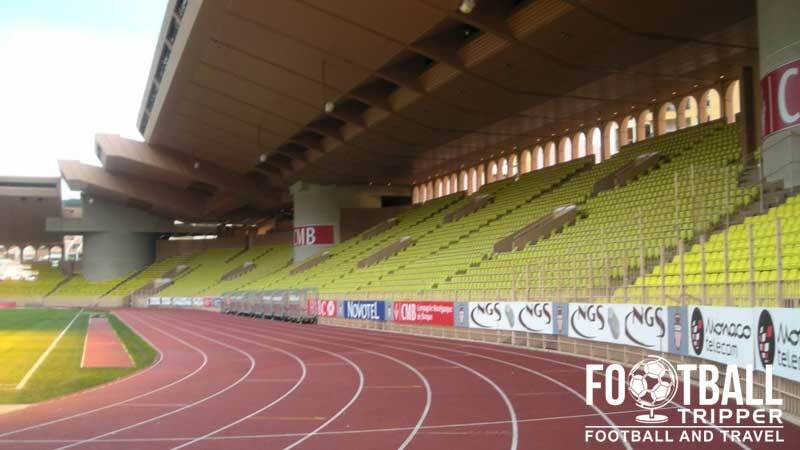 AS Monaco offer fans and tourists the chance to go behind the scenes of the legendary Stade Louis II by taking a 30 minute guided tour of the facilities. Costing just €5.00 for adults, and €2.50 for children the tour really is a bargain. Wednesday to Sunday: 10.00 am – 11. 30 am – 2.30 pm – 4.00 pm – 5.00 pm. Tours appear to be available up to five times a day, however the information on the official website does come across as slightly ambiguous. 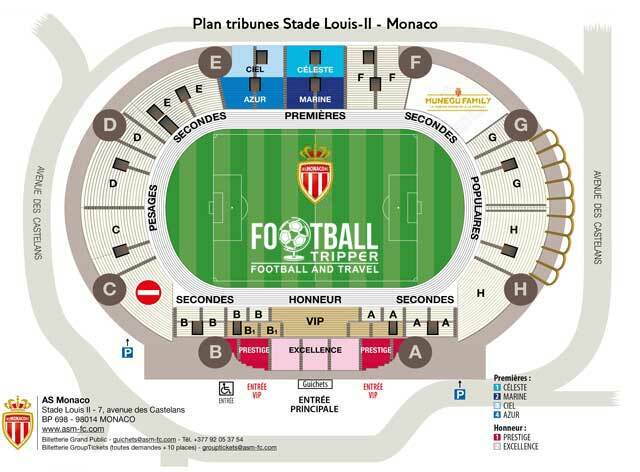 Tickets to see AS Monaco can be purchased online, at the stadium itself either in the week leading up to the match, or from one of the numerous ticket vendors located across the city such as Francebillet, Digitick and Ticketnet. One estimate in the 2014/2015 season put AS Monaco’s home support at an average of 9,411 which is the 19th highest in Ligue 1, so you shouldn’t have too many problems acquiring a ticket. Price wise Monaco tickets are surprisingly cheap with seats behind the goals starting at around €10.00 and typically going up to around €30.00 for a seat within the main grandstand. Of course, expect to pay a premium for the higher profile “gala” matches such as when the likes of PSG and Champions League teams come to town. Stade Louis II is located right on the South West border of principality of Monaco. the little state of Monaco. It is the second smallest country in the world with a total land border of 4.4 km meaning that you could feasible walk across it in an hour or so! The main entrance and sign of Stade Louis II, close to where the royalty enters. Monaco is very accessible either from France or Italy with the A8 motorway and the E80 road running parallel to the Mediterranean/Ligurian sea. Upon arrival, the battle for 40 parking spaces at the stadium awaits you, and if you are lucky there may be a chauffeur on hand to park your Ferrari for you. Monaco currently has a single railway station known as Monaco-Monte Carlo, and with a total track length of 1.7 km it is the second smallest rail infrastructure in the world. Once you have arrived in Monte Carlo via the extensive European high speed railnetwork you can either walk to the stadium in around 25 minutes or elect to get a taxi. The iconic arches of Stade Louis complete with Palm Trees. This is Monaco so there are no buses as they’re for peasants. The closest airport is Nice Côte d’Azur Airport which is a 30 minute drive away from the Louis Stadium, and Monaco’s outer border. It is the third busiest airport in France and acts as the principal airport for the Provence-Alpes-Côte d’Azur. There are a range of cheap flight operators available with some advertising Monaco as a destination via Nice Airport. Once you have landed you can either rent a car, get a taxi or catch a train to Monte Carlo with the Nice-Saint-Augustin railway station approximately 15 minutes walk from the airport. Hotels in Monaco are generally speaking quite expensive, but you can find some cheaper accommodation options if you’re willing to be slightly further out of the main historic centre and/or slightly away from the coastline. Having said that, both the Hotel De France and the Ambassador-Monaco are centrally located and appear to be “relatively” affordable. 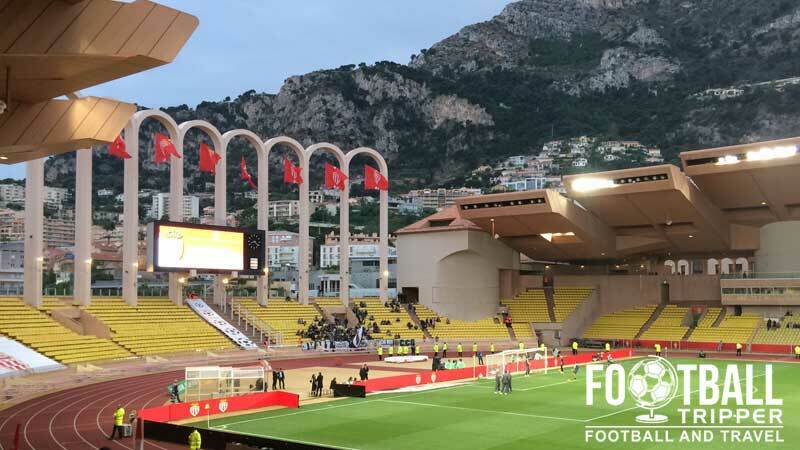 If you’re looking for the closest options to Stade Louis then Riviera Marriott Hotel La Porte De Monaco and Le Quai Des Princesa are the ones to look at, and although they both technically fall outside of the Principality’s borders they’re certainly not any cheaper for it.